The story of Australia’s Atlas Genius is an indie rock fairy tale of sorts. In a relatively short time span, brothers Keith and Michael Jeffery constructed a recording studio, recorded breakout single “Trojans” with friend and keyboardist Darren Sell, returned to school only to depart shortly thereafter to focus on Atlas Genius full time, became whirlwind internet and radio sensations, and landed in a comfy new home on Warner Brothers Records. 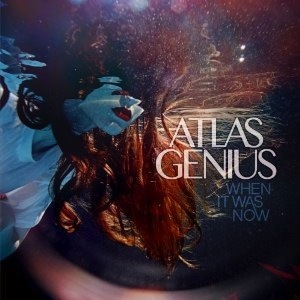 When It Was Now follows on the heels of the band’s wildly successful debut EP Through the Glass and satiates the appetites of fans who fell in love with Atlas Genius at first listen. The band takes a no-frills approach to songwriting. Keith’s lyrics aren’t overly complex but his vocal delivery soars and weaves through unexpected cadences against sunny guitar riffs and a touch of modern electro groove (“Back Seat” and “Centered on You”). This combination generates that familiar indie pop sound but with an odd little twist that sets When It Was Now and Atlas Genius apart from other albums by bands in their genre.